This is the second book in the Bobby Ellis- Chan series. Bobby's still in the fourth grade. In the first book, at a time when boys and girls shouldn't be friends, Bobby comes to terms with having a best friend who is a girl. Now Bobby and Holly's friendship is as strong as ever. The fourth grade class is putting on Annie. Bobby is happy to play Sandy, the dog, so he won't have to learn any lines. Bobby loves dog but can't have one because of his asthma. Unfortunately, his costume is too close to the real thing. The new gym teacher assumes Bobby can play football when he finds out who is father his. Bobby must also contend with a scary cat with 27 toes, being picked last in gym class and Jillian Zarr. Bobby's voice is perfect as is Yee's dialogue. As popular as skateboarding is there aren't many books with a main character that skateboards. Bobby is very good and loves the sport. Troy Eagle is his idol. "Bobby was a good solid skate boarder. Not showy, but not a wimp either. He'd study the bigger kids and then start off slow, working his way up to the trick, whether it was as simple as a nosegrind or as hard as an aerial. Though he still had trouble grabbing his board while flying though the air, he was getting better. " Dan Santat's illustrations are great. My favorite is of Bobby and Casey coming face to face with the neighborhood cat with 27 toes. The picture of Bobby's gym teacher breaking out the classic Freezer move in front of the entire class was a close second. I loved this book at first glance. Arthur is the bigger of the two and Max is the excited one with the yellow paint. Art knows how to paint now he's trying to teach Max. I love Wiesner's imagination, detail, and use of color. This is going to be a go to picture book for me this holiday season. I don't have words to do Art & Max justice, so check out the excerpt and watch Wiesner's video. This is the third Calvin Coconut book. This is a great early chapter series that features a diverse cast of characters. Calvin lives in Hawaii with his mother and younger sister Darci. Stella, the teenage daughter of his mother's best friend is staying with them. At school Calvin's class is given an assignment to write a persuasive letter. Calvin decides to write about wanting a dog. With the help of his mother's boyfriend, Ledward, Calvin eventually gets the dog he really wants. This works well as stand alone. Though it's best read in order, since Salisbury does a great job of developing the characters and their relationships. Jacqueline Rogers illustrations are great. I especially like the ones with Stella and Calvin. Rogers also show off Calvin's active imagination. Saltypie by Tim Tingle - I still plan on reading this one. It will be nice to read a story about an American Indian that is actually written by an American Indian. I loved Crossing Bok Chitto by Tingle. Author Zetta Elliott list all the MG/YA books published by African American authors this year. Many people help put the list together, including me. In the end there were only 50 titles for the whole calender year. A few titles may have been missed but not enough to make this to make this list respectable. Elliott goes a step farther and breaks down who published what. In case you haven't since it, check out author Mayra Lazara Dole's - Authentic Latino Voices in Hunger Mountain. How many Latino MG/YA authors do you think were published in 2010? Doreen's family, (parents and Momo, younger sister) are moving from Los Angeles to San Francisco. On the drive there Doreen discovers that she loves to doodle, it also calm her down so she can focus. At her old school Doreen was diagnosed with ADD and put on Ritalin. Doreen got in trouble at her old school, she didn't like being on Ritalin. With her journal and pens Doreen doesn't need it any more. Before the move Doreen went by Dodo. When they make it to their home she's Doodle. The author did a wonderful job with Doreen's voice. I loved it. Doreen is a smart girl, that worries a mistake she made will follow her to another city. The younger sister, Momo has a storyline of her own. The parents are actively involved, encouraging and supporting their daughters. I loved Doodlebug. Its entertaining, creative, serious and funny. 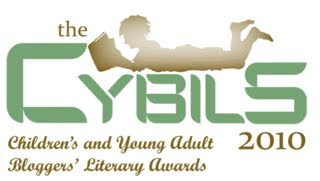 This is the 5 year of The Cybils or the Children's Young Adult Bloggers Literary Awards. I love The Cybils awards. Prince of Fenway Park by Julianna Baggott. Its nice knowing because of that nomination, at least five more people read a book I loved. I do remember seeing morereviews. From those 5 people word of book will continue to spread and so on. If there's a children's or young adult book you love that was released in 2010, nominate it between Oct 1st and Oct 15th. Its a great oppurtunity to give a book that moved you a little more exposure. 15 yr old Kyle Chase is a sophomore, is one the wrong track. He tries to figure out how he got there. What decision or non act lead him to a be an under achiever at a low rated High School. Kyle traces the steps of his choices. When I picked up You, my plan was to read a few pages and get back to it later. I could not put it down. Kyle Chase is as real as they come. Benoit uses the second person narrative to tell the story, adding another level of intensity. "Mr. Nagle asked you to stick around a moment after the bell. "I'll admit, you have been working harder in class, and when you've done the lab work it's always been very good, and I haven't had to speak to you about not paying attention in quite a while. But. " There's always a but. Its a magical word. You can say anything you want, go on for as long as you want, and then all you have to do is add the magic word and instantly everything you said is erased, turned meaningless, just like that. You're a really nice guy. Your mother thinks you need a new computer. You've been working harder in class. But. Benoit opens with a scene from the end. - You're surprised at all the blood. He looks over at you, eyes wide, mouth dropping open, his face almost as white as his shirt. He's surprised"
The ending comes full circle with the beginning. We learn what's going on with all the blood. The author pulls this off very well. You is a very well written and intense read. I loved it. 12 yr old Kevin Pugh spends a lot of his time in the basement, playing Madden Football and watching television. Kevin's dad, Howie used to play for the Bears. The Pugh's love in Chicago and the fans still love Howie. Kevin's younger sister Izzy is a soccer star, be he' s no athlete. At an annual charity kickball game between two news station, Kevin is hit in the head twice. Izzy was idly juggling a balled up sock. "It's just too bad you didn't stay in Kevin. We totally coulda won." "I was wounded," said Kevin. "Had to come out" Izzy threw her sock ball at Kevin, who lunged out of the way. "Where were those reflexes earlier, Kev?" Howie asked. "Not funny," snapped Kevin, adjusting his bag of ice. "I could have been killed today. Or braindamaged. I could be in a vegetative state right now because of a kickball." Howie rolled his eyes. "That was pretty impressive actually getting hit in the face twice by the same kick. Is there somebody at Guiness Book we could call? " Kevin's dog Cromwell used to lay around all day doing nothing until he an sees* an agility dog competition on Animal Planet. Out of shape Cromwell wants to be an agility dog. Kevin doesn't know want to make of the change is once inactive dog. With some financial help from his best friend Zach, Kevin and Cromwell enroll in agility classes. Elka the trainer has a special way with dogs. Kevin is convinced Elka speaks dog. Elka takes a special liking to Kevin and Cromwell. I loved The Fast and the Furriest. Behren's writing and characters are great. I laughed out loud a lot. I read the last scene over several times, and belly laughed each time. This book has much more to offer then laughs. Kevin has finally committed to something and grows more confident. For much of the summer Kevin keeps his where abouts a secret, knowing his football star father won't approve. When the truth is comes out Howie, isn't too happy at first but with the help of wife and daughter, he comes around. I am so glad I stumbled upon this book. I know I didn't do it justice so please check out the excerpt . Ages 11up. Very reluctant reader friendly. Justin Fisher is in the fifth grade at Spiro Agnew Elementary School. This has a great first chapter. Justin is remembering a lunch room incident from the third grade. Justin wonders if it never happened would he still be the class clown?
" So there he was, moving precariously forward with his tray, when things began sliding. The Jell-O shivered, slipping toward the edge. When Justin tipped the tray up, the three meatballs began to tumble, rumble, and roll in the other direction. To make things worse, Justin had a paperback book tucked under his arm and an apple wedged between his chin and neck. As he tried to stop the sliding, slipping meatballs with a minor tray adjustment, the daredevil Jell-O tried to make a leap for it. Look out below! It splattered on the floor, a splotch of green goo. As if that wasn't bad enough - Justin wondered what dessert could survive such a fall - a chunk of Jello-O slithered under his next footstep. And that was when the cardboard tray, complete with spaghetti worms and meatlike balls, flew toward the ceiling. Justin left knee buckled. His right foot slipped and kicked out making him look like a backward - falling punter on a football field. Shoulders tipped back, and back and back. At that moment, Justin Fisher had a pretty amazing view of the spaghetti as it soared up and up, like a flying snakes but without wings or feathers, magical airborne spaghetti right out of some crazy sci fi adventure movie"
I wish I could share the entire first chapter but I am pretty sure that's illegal. Preller writes Justin's "uh oh" moment so well. Readers will easily sympathize with Justin as his accidental fall plays out step by step. I am not one to make playlist for books. Though if I did "Tears of the Clown" by Smokey Robinson and the Mircles would be track one. After his public fall Justin decides to be in on the laugh, making himself the class clown. Fast forward to the fifth grade, Justin's still playing the same part, but his classmates are tired of it. His teacher Mr. Tripp has rules he expects to be followed. Justin doesn't like these rules. He decides to fight back, declaring war and acting out as much as he can. Justin gets himself into more trouble. In class he interrupts. Outside Justin sometimes tells mean jokes about other kids. Justin isn't a bad kid, he simply doesn't know where to draw the line. Part of me thinks Justin believes peoples feelings can be hurt if it leads to laugh because of what happened in the third grade. The fifth grade is getting ready for a talent show. Justin wants to be the MC but the other students think he'll ruin it for the entire grade. After the tryouts, Tori, a quiet call with a great voice calls Justin out. She tells Justin everyone thinks he's a jerk. When, I first read this scene, I wished it was longer. After, I looked back on it, I realized it was good as is. A shy girl confronting a boy who acted like a jerk is huge. As is the boys willingness to listen and not deny, laugh away or try to defend prior bad acts. I really enjoyed Justin Fisher Declares War. Preller's has a created a character in Justin, that isn't all good or bad. The author previous novel Along Came Spider , is also set at Spiro Agew Elementary School. Anyone who has read it, will like being able to see how best friends Trey and Spider are doing. I don't know if the author plans to set anymore novels at this school. But I hope so. Justin Fisher Declares War is a great suggestion for fans of Andrew Clements or Dan Gutman. *Smith's Bone series is very popular. Some young readers may like the fact that Justin is reading the same series as them. Preller was kind enough to participate in my 9 authors 12 questions feature to kick off the baseball season this year. I suppose I should do one of those, oh by the way I kind of cyber know the author but this is my honest opinion declarations, since I slipped in that feature in. So here goes, Justin Fisher Declares War is a really good book. That statement was not given under duress and there is no check the mail. I borrowed Justin Fisher Declares War! from my local library. I'm So Not Wearing a Dress by Mai S. Kemble - I really enjoyed this story about a tomboy who agrees to be a flower girl under a few conditions. The cover really pops in person. Thanking the Moon by Grace Lin - Since no one called me out for missing this release last week, I am convinced no one actually reads this feature. The Memory Bank by Carolyn Coman illus. by Rob Shepperson - You can't tell from this picture but its a diverse cover. Violet in Bloom by Lauren Myracle - I love this middle grade series. This was as good as the first one. Will review soon. My review of book one. Last Night I Sang to The Monster by Benjamin Alire Saenz. I let out a little squeal of happiness with I discovered who won. Benjamin Alire Saenz is such a talented writer and deserves a lot more attention then he gets. On Wednesday, I will be posting an interview with Jewell Parker Rhodes. I loved Ninth Ward. When I finished it my first thought was "I want to interview the author" But I was hesitant to ask. It was Jewell Parker Rhodes after all. Ninth Ward is her first children's novel but she has an extensive body of work. When, I finally did ask, Rhodes was kind enough to say yes. If you missed it do check out my recent interview with Jen Cullerton Johnson the author of Seeds of Change. I had difficult time coming up with questions. I had some serious question block ( is that a real thing? If not it should be.) Finally it hit me, with the exception of a group G. Neri interview with Edi and Ari about Yummy , this would be the only other time I would be asking an author questions about a non fiction book. Once I knew what the problem was, it got easier. This is the fifth year of the Cybils awards or Children's and Young Adult Bloggers Literary Award. I love this award, it gives some well deserved attention to some great books. Anyone is free to nominate a 2010 release. 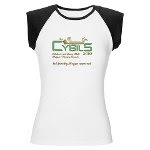 The Cybils site is very easy to browse and the organizer's make everyone feel welcome. I say the same thing about Cybils award every year. Though this the first year, I put my name in to be a judge. I will be on one of the panels but I won't say which one until the full panel is released on the site. I am very happy with my placement and to have the opportunity to participate in the Cybils awards. 13 yr old Sky lives in New Mexico with her parents and younger sister, Mouse. Sky's parents have protected them from the outside violence that continues since the first attack on 9/11, when a bridge was taken out. The attacks are so frequent there are instructions to follow. Sky lives on a ranch, they don't have a TV or internet. If something happens there aunt will tell them. Soon after, Dr Khalid ( a new colleague of Sky's mom) and Kareem move to New Mexico things escalate for the worse. Oil lines are targeted, showing the countries dependence on gas. Soon everyone from Middle East is rounded up and detained by President's orders. Simliar to what happen to Japanese Americans during WWII. Though Kareem is only in the seventh, he is still on the list. Sky's family comes together to hide him. When I started reading, I didn't want to stop. Sky's family pretty much keeps to themselves on their ranch. They live off the land, using solar power. Stanley doesn't make a lesson out of the families green living it simply is. I love the families interaction. Sky is a very realistic and likable character. The author does an excellent job of showing how hate comes from fear. Saving Sky moves at a great pace. I wish I could've have connected with Kareem more. I also wish the author would've taken more time to distingush between Middle Eastern countries. Perdomo and Collier have come together to create wonderful biography on Roberto Clemente. Baseball fans of all ages will love it. This is one of the funniest middle grade novels I've read all year. 12 yr old Griff Carver is no ordinary seventh grader. He has been a member of school saftey patrol since he was six years old. Griff Carver is the first saftey patrol officer ever to be kicked out of school, while on the job. "It wasn't ugly. At first blush, all you'd see is squeaky clean kids playing and killing time till the bell rings. Big lawn. Nice clothes. First-hand bikes. Right out of the school brochure. Maybe that's all you'd ever see. 'Cause you never wore a badge. Me? I carried that piece of tin for six years. Almost half my life. Started in first grade. Typical wet-behind-the-ears rookie. Made all the rookie mistakes. Thought I was God's gift to Safety Patrol. In retrospect, maybe I came on a little too strong. Like I was trying too hard. Like I could do it all myself. Maybe I was asking for it. Maybe not. Griff's mother wants him to start fresh at Rampart Middle School, no safety patrol. He tries but it's in his blood. Delane, Rampart's safety patrol captain assigns the reckless Griff a partner. Thomas, the new partner is a straight by the book patrol officer. He has won a merit badge for almost everything. Rampart's safety patrol team believe they have a tight lock on the hallways. Griff proves them wrong the first day on the job. There's something illegal going on and it leads back to Marcus, one of the most popular kid in school. Krieg has written a great noir mystery for middle graders. There's Griff unwillingly being interviewed by his guidance counselor regrading a recent incident. It's being recorded and will be passed up the chain of command. There's Griff the reckless, dot every i Thomas and there working relationship as partners. Can the captain be trusted?, and of course there's a girl. Verity runs the school newspapers, and is one of the few students unimpressed by Marcus. 12yr old Isadora (Izzy) and her mom are always moving. When the novel opens, the two are unpacking in their new apartment. Izzy finds a baseball that belonged to her dad, who died before she was born. The baseball has the words because and magic written on it. There's a space between the two, where another word should be. Izzy can't stop thinking about the missing word and what it might mean. She claims the baseball, even when her mom tries to take it away. Izzy will be spending a few weeks in New Mexico with her grandmother, while her mom works on a research project. This is the first time Izzy will be meeting her grandmother and visiting the village her mom grew up in. While she's there, Izzy is touched by magic and gets closer to her parents and figures out the missing word. I loved Izzy's voice. The author surrounded Izzy with some great characters. Including her grandmother, Mateo (a new friend and possible crush) and Maggie, ( a cute six year old, who refers to her cat Frida as doggie). Everyone played off of each other very well. The writing is colorful, magical,beautiful and perfectly in tune to a young readers sensibility. "I felt as though melted chocolate had oozed its way from my heart to my toes, coating me with comfort on its way down." After I read that line, I quickly re-read it. Its visually gorgeous and very fitting for a middle grade novel. The author had some more scenes, that made me stop and take notice. I am looking forward to reading more books by Cervantes. When, I saw Curse of the Were-Wiener on the new release cart the other day I squealed with happiness. I love this series. Danny and Wendell's school served a bad batch of Were Wieners. Danny's hot dog bites Wendell. The two only have a day and half to track down and kill the pack leader to save Wendell and the other students. "This is useless! Danny wanted to yell as Mr. Snaug droned on about something - the stratosphere or adding factions or something. Don't you see the class has lycanthro - lycatrop- lyka- werewolfism!? The only thing that kept him from leaping onto his chair and shouting that out loud - other than the fact that he couldn't pronounce the word, even inside his head- was that if he did, he'd probably get after-school detention. And tonight of all nights, he couldn't afford to be late, or have his mom get wind of any trouble. She'd agreed to let him spend the night at Wendell's , but if he came home with notes about yelling gibberish in class, she might reconsider. " Like the first two , the friendship chemistry and dialogue between Danny and Wendell are very good. Though this time Danny and Wendell are on their own. Before I started, I thought it was a given that Danny and Wendell would get on the bus to visit one of Danny's many relatives. When this didn't happen, I thought to myself, "What!, look at Vernon keeping me on my reading toes." I would've been more than happy with keeping things the same but Vernon decided different and it worked just as well. Curse of the Were-Wiener is a little more scary and creepy then the first two. Though not too much, just enough to make it that more fun to read and maybe causing a few arm hairs stand up. Dragonbreath is a great suggestion for Diary of the Wimpy Kid fans, since its very funny and part graphic novel as well. The series can be read out of order, however, I highly recommend starting from the beginning. Not a lot of new releases this week. The list in longer since I am still including a few titles that came out earlier in the year. Don't Let Aunt Mabel Bless The Table by Vanessa Newton (new release) Newton a still a pretty new illustrator/ author and I really like her style. 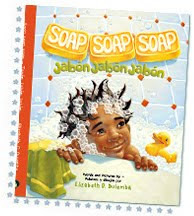 Soap Soap Soap/Jabon Jabon Jabon by Elizabeth O. Dulemba (new paperback release) click over and watch the trailer its very cute. Secret Lives of Princesses by Philippe Lechermeier illus by Rebecca Dautremer. This is a gorgeous book and there are brown princesses. Calvin Coconut: Zoo Breath by Graham Salisbury (new release) Third book in a great series. My review of book two. The Aristobrats by Jennifer Snow I had forgot this one last week, Liz B's review reminded me. Spike Alienson by Malaika Rose Stanley illus. by Sarah Horne - The good news - the book is out and looks very good, click over, read the excerpt. The not so good news its a UK release. I won't make a habit of showing UK new releases but I couldn't resist. It very hard to find funny, contemporary middle grade novel's with Black male protagonist. 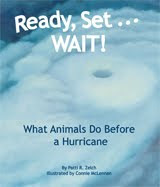 Zelch answers the question to What Animals Do Before a Hurricane? This was a great, easy to follow, and very informative look at what some animals do with a hurricane on its way. Three of the animals included, crocodiles, manatees and butterflies. I love Zelch's straight forward text. "Crocodiles may crawl to open water or into deep canal and rivers that crisscross the land. Concealed below the water's surface - they wait!" McLennan's illustrations are wonderful and fit perfectly. The author inculdes some more facts in the back. Including - What is a Hurricane? and When Hurricane season is? There's a world map and graphs to rely some very useful information. Ages 5 up. I tried to think of something to open up the football season the way I did with baseball but I came up empty. Here's a list of football books, I did back in 2008. I can't believe I picked the Chargers to go to the Superbowl. They're awful in the playoffs. I wanted to highlight a few titles, that I loved. Please don't sleep on any of them, they're all very good and go beyond the field. Deadline by Chris Crutcher - Is isn't about football but it has some great football in it. Daniel True is a senior at his Seattle H.S. He dreams of becoming a journalist. When Daniel isn't voted editor newspaper, he's very surprised and disappointed. To make it even worse the new editor is making him the sports reporter. Daniel likes watching sports but he wants to cover real news. At school everyone calls Daniel - Mitch, short for Michehlin Man, an unwanted name he got his first day of high school. Daniel accepts the new assignment as sports reporter. When He and Kimi Yon (his photographer and crush) go to football practice they notice a very talented new player, Angel Marichal. Though for some reason Angel is keeping his ability a secret. The coach isn't using Angel to his full capacity. Daniel knows something is up and is deteremined to find out what. Breaking this story might be his big break. This is Deuker's first novel where the main protagonist isn't an athlete. It was an expected change, but there is still no denying the author's strengths. The sports action is always excellent. The reader can easily picture every play. Though Daniel isn't a player, there's still a lot of football in Payback Time. "My gut hurt so much, I didn't even want to move, so instead of going into the house, I sat in the silent car. I'm not the kind of person who will ever make news. I'm too ordinary, and I've known that for as long as I can remember. That's why the movie about Nixon had been such a big deal to me. I could picture myself being like those reporters. I could scratch a story until I got to the bottom of it. The newsmen in Afghanistan and Iraq didn't charge into battle firing guns. They carried cameras and tape recorders and paper and pencils. Those were the tools they used to shine light into the darkness. I thought that someday I'd be brave like them. But tonight I hadn't had the courage to keep my fist clenched around a set of keys." It's almost time for baseball playoffs. If you missed it do check out 9 Authors, 12 Questions I posted back in April . Deuker was kind enough to hold down the catcher's spot with Painting the Black.